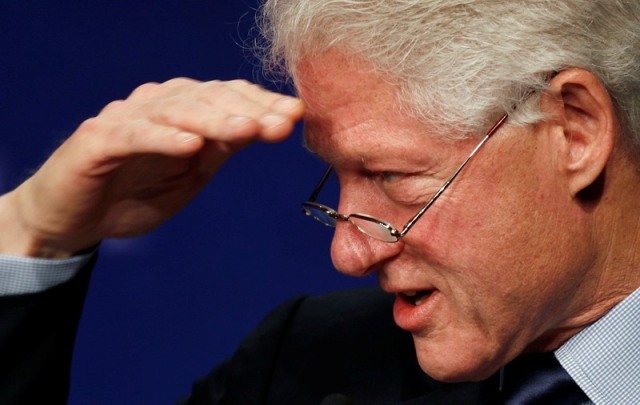 That is our former President Clinton looking to see if Bob and my brother in law are still stalking him.We were all in Chappaqua, Bill’s town, for Thanksgiving to visit my brother, the famous neurosurgeon. The three of us (Bob, brother in law and me) escaped the family and went to town for Starbucks. While we were sitting there two black SUV’s pull up and out pops Bill. You would have thought that Bob and the brother in law had springs on their asses flew out of their seats so fast. They trailed him down the street, gawked through the store window, and then went into the store. They gawked some more from outside and then slowly, ever so slowly walked back to Starbucks, backwards, and then stood outside of Starbucks and waited for Bill to exit the store. I sat alone with my ice tea the entire time. Finally, I went outside and said, enough, you will be arrested. You are like president groupies. So they begrudgingly followed me down the street to the Squires store so I could look at some Ugg boots. And wouldn’t you know, there was Bill and the Secret Service and as I sat down to try on the shoes, Chelsea sat next to me. I am so glad that I had clean socks on that day! So I dawdled a bit allowing Bob and the B-in-law to legitimately hang around Bill. And after I got one pair of gray Uggs, I tried on several other shoes, in order to drag out their fun just a bit longer. They all fit perfectly and then as Bill was paying for Chelsae’s shoes I went up the counter with Bob and without missing a beat I asked him for his credit card and he was so awe struck just being that close to Bill that he just handed it over. So I would like to thank you Mr. President for working your personal magic on the slumping economy. And my feet thank you for all the shoes Bob so mindlessly paid for while being mesmerized by you. Seeing you was the highlight of their entire weekend, they texted, called and sent photos of you to everyone they have ever known. The brother in law said isn’t it great that Bill can just walk around the town and not really be bothered by anyone. And I gave him one of those, you’re kidding me right? looks and he added ” Well, except for us”. The last time I saw anyone that excited was our daughter Jill at the Justin Beiber concert this summer. She is 14! Whatever it is your have, you still got it! P.S. I love my new boots!